Take time in the morning to remember those who worked so that we would have food. Say a blessing as a family. Baruch atah, Adonai, Eloheinu melech ha-olam, hamotzi lechem min ha-aretz. We praise you, Eternal God. Thank you for the food you provide for us to eat. 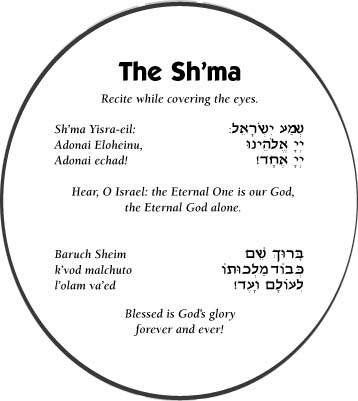 The Sh’ma has been the Jewish declaration of faith for thousands of years. Jews everywhere say the Sh’ma, but especially in the morning and at night, to remind ourselves that life is a gift from God.It is our personal and communal expression of belief in God and in the unity of the Jewish people, as well as our recognition that there is a relationship between God and the Jewish people. The Sh’ma is between you and God and between you and your child. It is an expression of belief and affection. Feel free to express love for your child as you express love for God. Show your affection visibly. What works best for you and your child should be your guide to crafting your own Jewish bedtime ritual. You can begin by just reciting the Sh’ma, or looking at colorful picture books, or humming a relaxing melody. Transforming bedtime into Jewish time lets your child understand that being Jewish is a way of life, and a constant source of comfort. Download a resource page from the URJ.